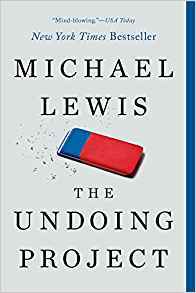 Book Review: The Undoing Project by Michael Lewis : Executive Leader Coach @ dbkAssociates, Inc. There are a couple of authors who I like to “follow.” By that I mean, I usually get any new book they publish. Michael Lewis is one of those authors. It all started with Moneyball, even though I’m a dyed-in-the-wool NON sports fan. And so The Undoing Project was a must on my reading list. From what I read, what is getting undone is the idea that we can rely solely on data analysis. Turns out that some good old human intuition and interpretation is often useful. In other words, getting back to the understanding of the imperfections and unpredictability of the human mind. I think the point is that we can never underestimate the way human beings can “screw up the data.” Not even on purpose! So as we do the analysis of the “big data” we collect, we have to be prepared to allow for human foibles. Trying to insert human foibles back into analysis of cold data is difficult. As Lewis explained in the coda to his book, the data folks (economists) and the human mind folks (psychologists) didn’t like each other. So collaboration was problematic at best. — Lewis, Michael. The Undoing Project: A Friendship That Changed Our Minds (pp. 340-341). W. W.Norton & Company. Kindle Edition. It turns out that the human mind is just horrible at seeing what it doesn’t expect to see. The psychologists Daniel Kahneman and Amos Tversky were what Miles Shore, Professor of Psychiatry at the Harvard Medical school, referred to as a fertile pair. Together they were exceptional according to Kahneman. What their work showed, and what Lewis is pointing out, is that we have to undo our dependence only on cold data analysis and include human nature in our analysis. By doing so, we will get much closer to accurate predictions and understanding of the real probabilities.